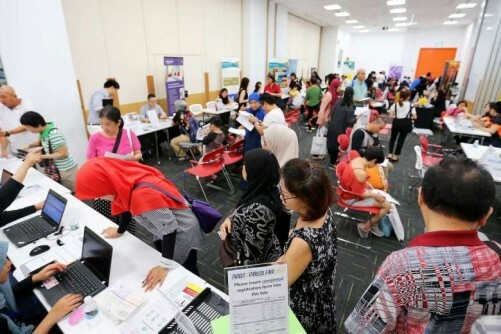 SINGAPORE - Around 1,500 job seekers went to the Skills and Career Fair 2017 on Sunday (April 23), with about 400 registering for jobs and 350 for skills training courses. One-fifth of the jobs offered were for professionals, managers, executives and technicians (PMETs). Said Minister for Communications and Information Dr Yaacob Ibrahim: "The number of PMETs out of job today is a worrying number as the economy is going through a transition. "Even those who are employed cannot assume that their job is secure. They may decide to move on to another area or go deeper within that sector." He spoke at the sidelines of the fair at the Lifelong Learning Institute in Paya Lebar. The job fair is the first collaboration by self-help group Yayasan Mendaki, professional services firm SSA Group and social enterprise Mendaki Sense. A total of 14 employers from 10 industries, including aviation, logistics, hospitality, food and beverage, and early childhood, conducted walk-in interviews for visitors, said SSA Group chief executive Mr Suhaimi Salleh. Several training providers were also there to offer skills upgrading courses under the national SkillsFuture programme. Said Mr Suhaimi: "While SkillsFuture is beneficial and generous, it is not getting the desired traction from our (Malay-Muslim) community." Dr Yaacob Ibrahim, who is also the Minister-in-Charge of Muslim Affairs, said the community needs facilitators like Mendaki and SSA Group to create awareness of the SkillsFuture benefits and help the community tap on the national scheme. Said Dr Yaacob: "When you open up the Singapore Workforce Development Agency website and see 18,000 courses, how would you navigate it to see what is relevant for yourself? So, you need intermediaries to explain to the community that this is money that you can use." One exception is part-time security officer Mohd Johari, who said he has exhausted his SkillsFuture credits doing four courses- supervision skills, computing, security and readiness of service. Mr Johari, 56, said he attended the job fair to support friends who knew little about the courses. The skills he learnt allowed him to qualify for a wider range of job opportunities, he added. "Most people in my group of friends don't have the confidence to find out about the courses available, or don't know about SkillsFuture at all, so I've come to help them," he said.